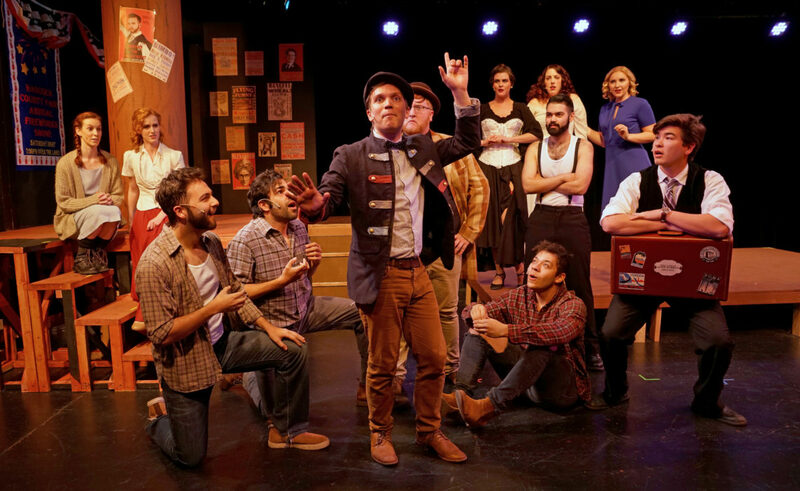 A brand-new musical made its world premiere on the black box stage of the Hillcrest Theatre for the Arts to kick off 2019. “Scott Robbins & the Traveling Show” had been percolating in the mind of Tyler Tafolla since he started writing it while a college student nine years ago, as an assignment to expand upon a character in a production of “Godspell.” It finally came to fruition while he was attending AMDA College and Conservatory of the Performing Arts in Los Angeles, becoming the institute’s first full-length original musical. Its premiere at the Hillcrest Center for the Arts (January 3-6) was produced by Young Artists Forever and directed by Carly Jean Paul, a fellow student of Tafolla’s at AMDA. Like Lin-Manuel Miranda, Tafolla wears several hats, writing the book, the songs, and starring in the title role of Scott Robbins, a Depression-era flim-flam man who hides out in a failing traveling circus where he finds love and respectability among his fellow performers. Tafolla is a charismatic actor with a superb singing voice, and from the moment he makes his first appearance, he immediately endears himself to the audience. As a songwriter, Tafolla is from the Ashman/Menken school of Broadway show tunes: well-crafted and tuneful with some (“The Gypsy Song” and “High Card Lady”) even being memorable. The predictable story bears more than a passing resemblance to Meredith Willson’s “The Music Man” in its major plot elements and supporting characters. Like Harold Hill, Scott Robbins, a patent medicine pitchman, is on the lam after fleecing his victims out of $10,000. Through his fast-talking abilities (“The Con Song” = “Ya Got Trouble”), he ingratiates himself to small-time circus impresario Oliver Circo (an effective Mitchell B. Horne), who hires him to be his troupe’s magic act. Like Marian the Librarian, Alice Barker, the circus’s featured performer, played by the always wonderful Jen Ridgway, has been burned by insincere men before and initially loathes and distrusts Robbins (“Smoke and Mirrors”), but inevitably falls for him when he endears himself to her younger sister Dolly (the equivalent of the lisping Winthrop Paroo), played by Alecia Winter Scott. The lovers share a confessional-at-the-footbridge moment when they sing “Mi Amore” to one another that is effective, but does not challenge the romantic splendor of Willson’s “Till There Was You.” Like Harold Hill, Scott Robbins has a colorful sidekick with a penchant for loud sport jackets: Artie, played with gumption by Jacob Kelso, a former accomplice who has gone straight (like Marcellus Washburn) Artie gets his “Shipoopi” showcase in the Act II rouser, “Oh, Nelly!” There’s also a nice bit by Haley Chaney as Artie’s saucy and somewhat dim love interest, Penelope. Aside from comparisons to “The Music Man,” there is much to like in “Scott Robbins.” The action is lively and never lets up and the characters are well developed. The story, however, could stand some fleshing out, and there is plenty of stage time to do so, since the production runs only about 90 minutes. A few fully developed production numbers and story refinement would work wonders, such as expanding the character of circus villain Barnaby (always a great name for a bad guy), Alice’s rejected suitor who is trying to take over the circus. Barnaby is well played by Matthew Markham, whose innocent-faced character could be improved by giving him a more dastardly, mustache-twirling presence. Chris Lewis plays Barnaby’s henchman Mort while the team of Jack Powell, Jasper Thomas III and Marcello Padilla portray Artie’s accomplices, a trio of fighting misfits who become circus clowns, although this “traveling show” is really nothing more than a vaudeville troupe. Despite its derivative nature, you have to give Tafolla credit for making his dream come true with this promising production. We hope he takes it further as it gets its theatrical sea legs.